An exhibition featuring classical and contemporary examples of Hilye-i Şerif and prayer beads will open in the Vatican on Oct. 1. The Hilya al-Sharif is a description of the personal virtues and the qualities of the Prophet Muhammad. What make the pieces interesting are not just the words used to describe the Prophet but also the designs made out of these words. Running until Oc.t 19, the exhibition titled “Aşk-I Nebi Sanat Olunca” (When Love of the Prophet becomes Art) will be presented at the Cancelleria Palace, known as the first palace built in Renaissance style in Rome. According to a statement made by the Association of International Culture and Arts, or UKSD, the exhibition will include 30 Hilya al-Sharif, five from the Ottoman era, and some 100 strings of prayer beads. 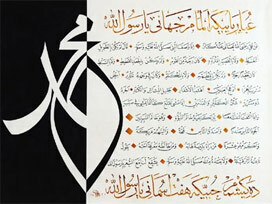 It is the first Hilya al-Sharif exhibition organized outside Turkey. Please type '210' into this field.